Make the caramel: Mix the water and sugar in a small saucepan. Cook, shaking the pan every so often, until it turns light brown. Remove from heat. Sear the pork on all sides in a frying pan that is safe to go in the oven. Add in the garlic cloves, fish sauce, coconut water, and caramel, and mix well. Put in the oven at 300°F for about 4 hours until tender and easy to shred. Shred the pork and place in a bowl. Remove the fat from the pork cooking liquid, and pour the remaining liquid over the shredded meat. Peel and chop your hardboiled eggs. Cook the noodles to package instructions. Roll out your pie crust thin so it is about 3 inches wider in diameter. Cut 4 circles from the crust. Meanwhile, place the dip ingredients into a food processor and blend until smooth. Serve the empanadas with the sauce on the side. Thit Kho is a traditional Vietnamese dish that involves sweet and salty pork cooked in a caramel sauce. It’s served with hard-boiled eggs over rice or noodles. 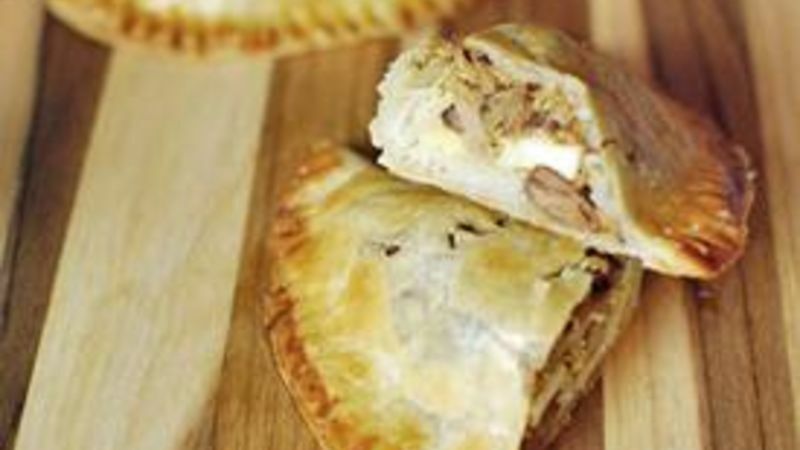 I thought this pork and egg dish would make a perfect empanada filling! Shredded meats and hard boiled eggs are a common empanada ingredient in South America, so why not put in a Southeast Asian version? These Vietnamese Thit Kho Empanadas came out great! A quick mint and yogurt sauce completed a dish that was packed with all the things I love about Vietnamese food. Make a quick caramel to cook the pork in. It’s really just water and sugar boiled off until it turns a light brown. Brown up some pork in a hot frying pan. Then add your caramel and some coconut water. Pop it into the oven for a few hours. When it comes out, the pork has some nice brown color and is perfectly tender. Empanadas taste better when the crust is nice and thin, so I rolled the pie crust out a little. I just use whatever round object that I happen to have to cut the dough. Today the lid to a pot was the right size. Some noodles, egg, and pork. Brush with egg wash and sprinkle with a little sugar before putting them into the oven. Meanwhile, toss mint, garlic, onion, and yogurt into the food processor and blend it smooth to make this quick dipping sauce. Dan Whalen thinks more things should be braised in caramel. He has been blogging for over 4 years at The Food in my Beard; check Dan's Tablespoon profile often to try his recipes with creative international spins!